It's that pink and red, candy, hearts and flowers time of year again. I'm not sure what it is but I've been really obsessed with pink and red lately, so much so that I bought this rug for my cloffice. 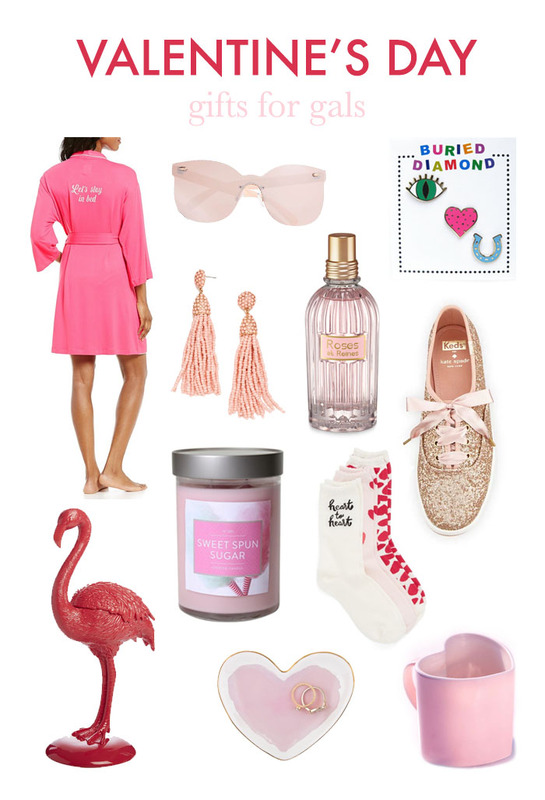 Anyway, I've been trying to plan for this Valentine's day and thought I'd do a roundup of some fun gifts for girlfriends, sisters and mom. Why not show yourself a little love too? I won't judge since I personally bought a few of these things (the pins, sunnies, and perfume) for myself already .🙊 I had to make sure they make good gifts first, right? When in doubt, you can never go wrong with candy and flowers though, am I right? As I'm sure you've noticed, it's been a while since I've posted anything here. My Instagram and additional social medias have also been lacking. I always have good intentions of pulling myself together and making myself get out of the house with one of my forced photographers (i.e. Kyle or my sister if I'm at my parents) and create content. But then I make a list of excuses or stay in bed just a bit too long and I don't follow through. Maybe it's the "stress" of a new (to us) home that needs a bit of a personal touch makeover and keeps sprouting new repairs (looking at you, toilet that suddenly started pouring out water unless you pile books in precisely the right place on the tank. Oh and you, furnace that quacks like a duck & squeaks on and slams off 14-16 times in a row as I try to fall asleep 😒 ). Maybe it's because I let my grading pile up again at the end of the semester and totally let the thought of a new semester overwhelm me for no reason. Maybe it's because it's either freezing cold or raining on the days Kyle is home during daylight. But mostly, I think it has just been a combination of the aforementioned and a total lack of inspiration and motivation. For heaven sakes, it's taken me almost three weeks just to formulate this post! So I decided to take some time off from overthinking what I'm going to wear everyday, shopping for clothes I really didn't need, and trying to force myself to create a post just for the sake of posting. I took to Pinterest, many, many Instagrams and blogs to gather all sorts of inspiration I had been lacking. I looked up new recipes to try to break out of the usual pasta/rice/spaghetti squash with some sort of meat (let's be honest, usually chicken) routine that I had grown so tired of making and eating. I failed at making some of those recipes and was half decent at others. I began thinking about renovations that need to be done along with some that I would like to be done and actually worked on making some of them come to fruition. But most importantly, I spent some time really thinking about what makes me happy and how I can reflect those things in what I'm sharing here. The more I mulled over it, the more I realized I shouldn't let myself stress about these silly little things like the house still being a mess or "OMG it's too dark to photograph what I wore to work today" or "crap, haven't I shared this work outfit already?". Suddenly motivation flooded back into me and all the things I was letting myself get worked up over, that ultimately made me shut down and stop creating, started to come naturally again and I'm finally ready to get back in the groove. Sorry for the boring rambling with only one photo, I'm working on some colorful posts and hoping to share some home photos (besides the above photo of our dollhouse bathroom) soon.